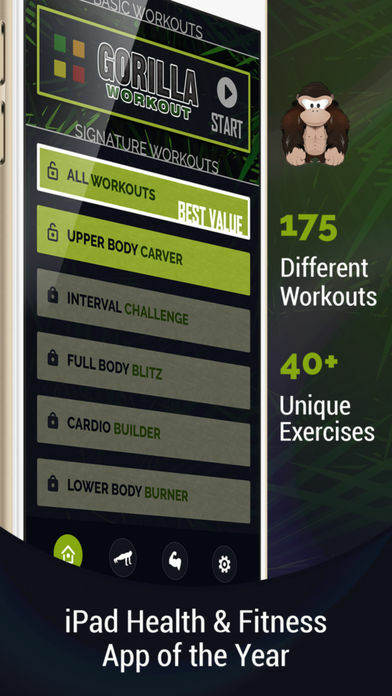 The Gorilla Workout: Body Beast app is an easy to use mobile workout schedule to help anyone on any fitness level. Upon opening, an introduction explains the focus of the app. There is no equipment necessary. The goal is to give you a short, everyday workout, keeping your heart rate up and teaching you proper techniques for a variety of exercises. This is done through video tutorials and in-depth description so users can easily follow along. To start, click the Get Started button. Select the fitness level you would like to begin ranging from 1 for the easiest to 4 being the most difficult. The levels are measured by the amount of push-ups you can do with Level 1 being 0-10 push-ups and Level 4 being 75 and up. The workout is then structured for that fitness level, which can be changed anytime in case you find it too challenging or too easy. After choosing level one, I was assigned 20 different workouts, one per day. It included instruction for each move with an assignment of amount to be performed and number of rounds. A timer is included to keep track of how long your workout lasts and there are built-in progress trackers to easily monitor your journey. What I like about the app is the thorough instruction of each move. Not only does it show you how to do it, but includes information about the muscles that will be worked. The demos are YouTube videos but they play in app so there is no leaving and coming back. A reminder can be set to keep you motivated and on schedule for the next day’s workout, and is also available for Apple Watch. Gorilla Workout does leave it mostly up to you to do the work. The instructions are great, but I would love a video to follow along to for my workout. Of course, everyone’s style is different. 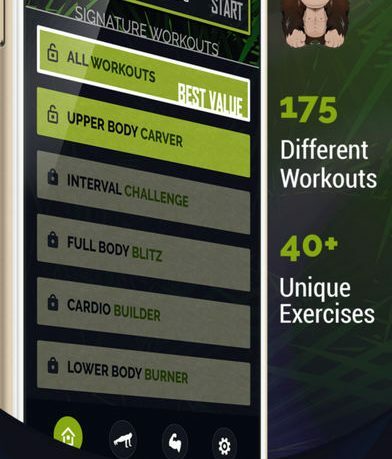 The app itself only includes the basic workouts but also offers additional individual sets that can be purchased. These include different category divisions like time trials, interval challenge, and cardio builder just to name a few. Their best value comes with all of the signature workouts for only one $9.99 in-app purchase. Gorilla Workout: Body Beast is a handy app for anyone looking or some easy to use workout instruction on the go. The app is available now for $0.99 in the App Store and is compatible with iPhone, iPad and Apple Watch.